A massive chemical fire south of Houston triggered an emergency order for locals to shelter in place even after a dangerous chemical was detected in the air. Local officials and public health experts said most of the risk from the Deer Park fire has passed and that further testing didn't find elevated levels of the dangerous chemical after a release Thursday morning. But activists have said the nearly week-long incident brought attention to the risk facing communities near facilities that use dangerous chemicals on a daily basis. "We're all being completely violated in a way that we're really not talking about," Yvette Arellano, an activist with Texas Environmental Justice Advocacy Services told ABC News earlier this week. EPA and local agencies are now testing water around the Deer Park fire to evaluate the impact of the fire on surrounding areas. The foam used to fight the fire could include persistent chemicals that cause health problems at high levels, as well as chemicals from the fire that could wash away into the environment. As of Thursday, the city said the runoff of firefighting foam and chemicals didn't threaten drinking water. They will be testing the Houston Ship Channel and bayous in the area for contamination, one of which is already a contaminated Superfund site. Arellano, the TEJAS activisit, said his organizaiton has been pushing for a more comprehensive air-monitoring system around Houston-area chemical facilities, stricter enforcement of violations and more transparency about the impact of fires like this on surrounding areas. The group says this week's fire brought attention to incidents they see all the time. The Houston Chronicle reported in 2016 that an incident at facilities using hazardous chemicals happened about every six weeks. 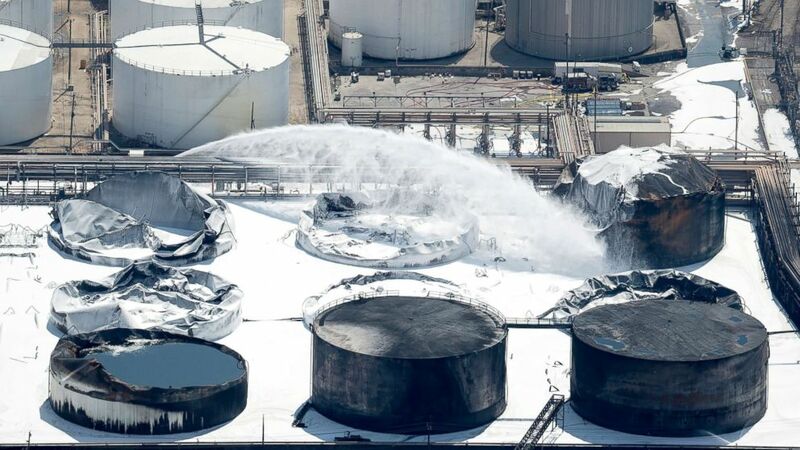 "This is the reason why whenever there's a fire, people finally get to see what the home of the largest petrochemical complex looks like -- only when this sort of thing happens and then they turn a blind eye," said Anna Parras, another member of the group. After Hurricane Harvey, storm-related damage triggered a separate toxic fire that prompted calls for companies to be more prepared for disasters and other unexpected scenarios that could create public health threats. Local officials insisted the order to stay inside was a precaution and that further testing didn't find elevated levels of the chemical. Benzene has been linked to leukemia and other health problems, but the concern is typically for long term exposures. Officials from the company, Intercontinental Terminals Company, said the chemicals were released when trying to cover a compromised tank of chemicals early Thursday morning, but no additional emissions were detected. But throughout the week, exposure to the chemicals, smoke and small particles from the fire led to concern about health impacts to children, older populations and people with chronic illnesses. Susan Arnold, an occupational health professor at the University of Minnesota, agreed with local officials that the public health threat from the smoke earlier in the week and the benzene release probably was limited -- if tests haven't continued to show high levels. "We want people to be informed but not inappropriately alarmed, and what we know about benzene, the cancers we know about typically occur from exposure over a long period of time," she told ABC News. Some activists are still skeptical about the comments from officials and say they still want more federal oversight of chemical facilities. Arellano said she's still concerned and wants more information from state officials on whether residents should be concerned about exposure to chemicals or ash that may affect their homes, pets or swimming pools. "Our biggest concern," she said, "is that folks take protective measures, post everything, to make sure they're not exposed to any residue." Environmental groups conducted their own monitoring after Hurricane Harvey and found Benzene levels they said were cause for concern after the Arkema fire, even though it didn't go over Texas' recommended limit, according to reporting from ProPublica and the Texas Tribune. Texas has a higher limit for when Benzene released into the air triggers public health warnings than other states like California, which has some of the strictest environmental regulations in the U.S. Activists who have been involved in suing to force the Trump administration to implement new rules on chemical facilities say that's one reason there should be more federal oversight. "I know everybody says, 'Well this is a matter for states," but if you think about the public health threats it's silly to think residents in California need to have lower benzene than people in Texas," said Daniel Rosenberg, director of the Center for Science and Democracy at the Union of Concerned Scientists. But a former EPA official who worked as deputy administrator for the agency in Texas said the EPA only takes a bigger role in these situations when asked by local officials, or if there's an extenuating circumstance. Stan Meiburg, former deputy administrator for EPA Region 6, said Texas officials are very experienced in dealing with these kinds of incidents, which can affect poorer areas more harshly. "One thing government can do," he added, "is make sure communities in close proximity to these facilities are being protected in the same way people with more advantages are."